Cover design by Scott Citron using photos by Robert M. Thorson. 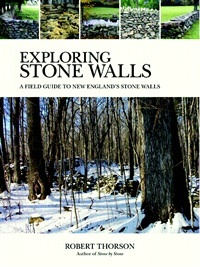 Exploring Stone Walls: A Field Guide to New England’s Stone Walls (New York: Walker & Company, 2005). This was the first field guide to New England’s stone walls. As such it sold well in nature centers and bookstores within the region through several printings. Bloomsbury, which purchased the book’s publisher (Walker), let it go out of print, but it’s still available online as used copies. As author, I take great pride that this first field guide to New England stone walls, has since been incorporated by others in alternative versions (the sincerest form of flattery). Many correspondents have remarked that ESW rides around in their cars and pickup trucks as they travel the backroads of New England, if only because wall-watching beats bird-watching when there are no birds around. There’s even a life list at the end of the book. So far, I’ve found only one professional review on line. It’s as supportive as it is humorous. From Northern Woodlands Magazine. This book wasn’t my idea. Rather, my publisher George Gibson and wife Kristine ganged up to convince me it was worth doing. For a color peek at what’s inside the book, link to Ten Walls. I believe that all of these are listed and described in the book. For an idea of what to look for in a stone wall, link to Stone Wall Science. Somehow, this black dike of basalt managed to squirt its way along an unseen fracture in the granite of Acadia National Park. And then, before it cooled completely, the dike was rent by motion along a fault that is otherwise impossible to see. It’s things like this that make wall watching lots of fun.